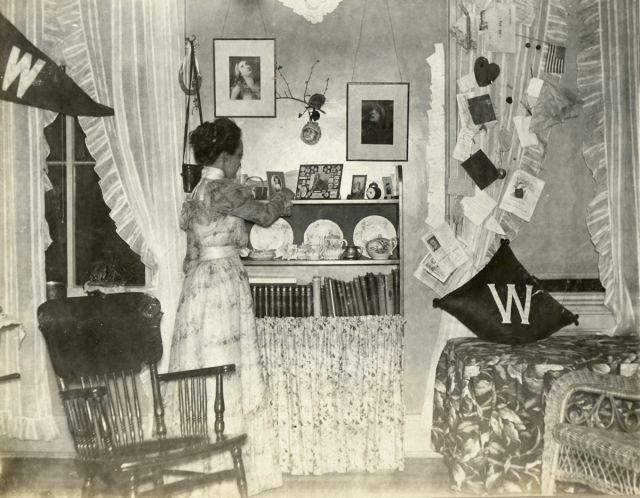 This woman's dorm room from 1898 isn't much different from modern day dorms: Pennants, books, and a chair for studying. 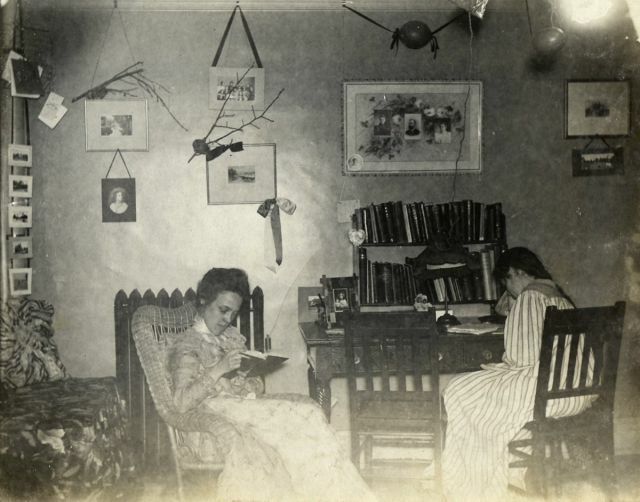 Photographs and mementos kept things homey in this room, in 1899. 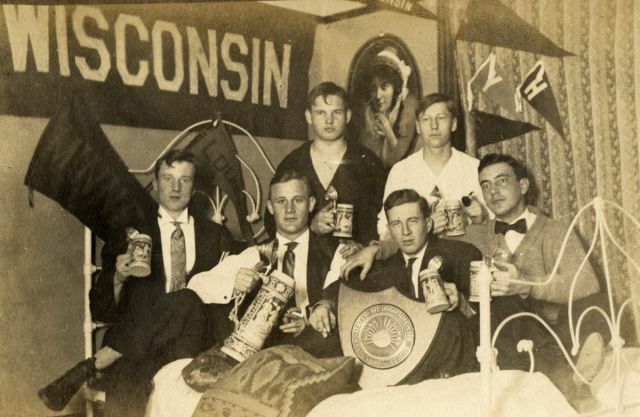 Male students raised a glass in a boarding house or fraternity in this 1909 photo. 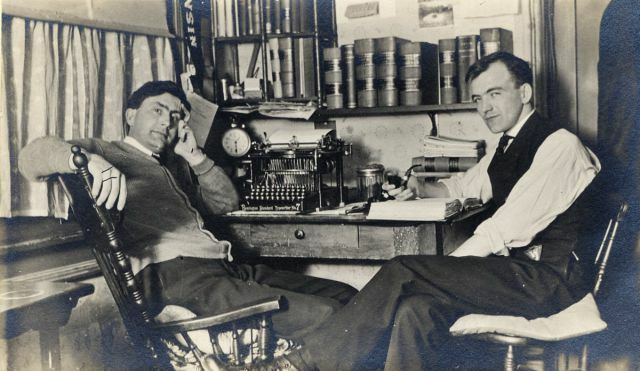 Imagine pecking out your thesis on that typewriter, shown in a 1909 photo. 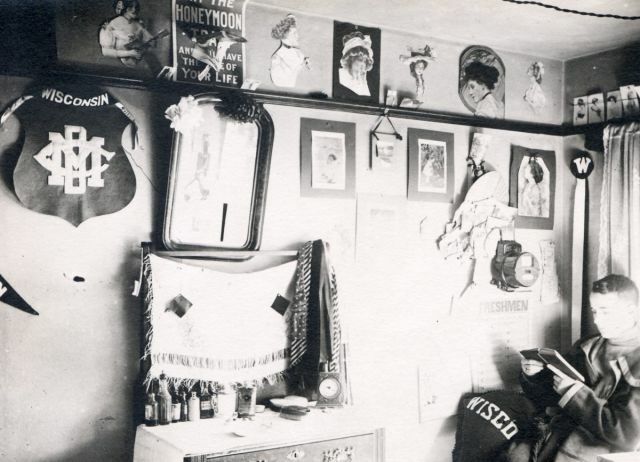 By 1912, pin-up ladies were essential decor. 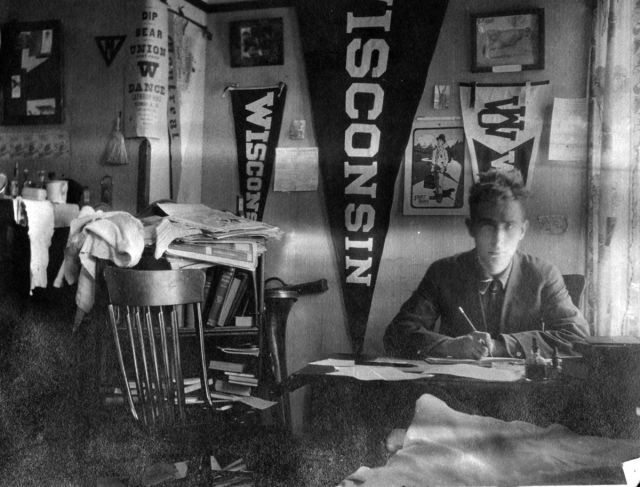 So were displays of college pride, as seen in this image (1912 or 1913). 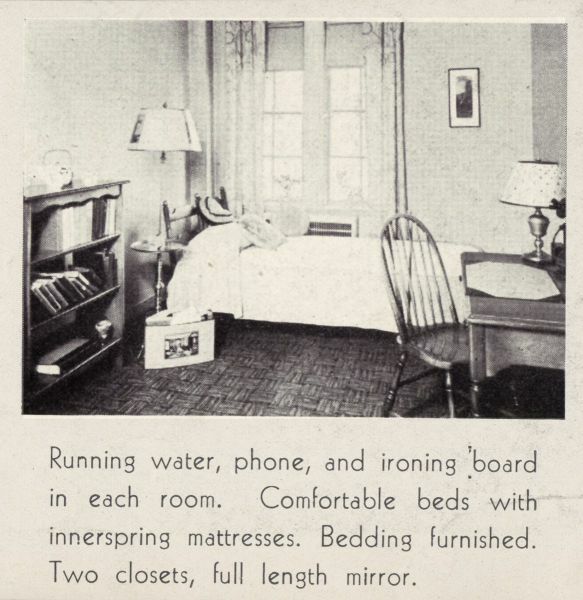 An ad for a room in 1927 noted perks like running water, a phone, and an iron. 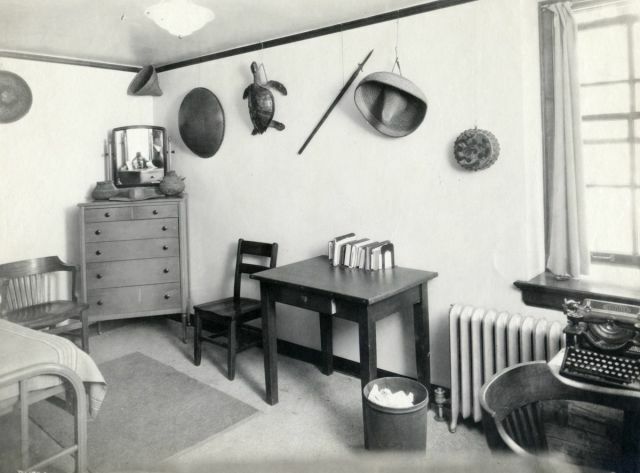 This single dorm room from the 1930s appeared to be filled with souvenirs from exotic adventures. 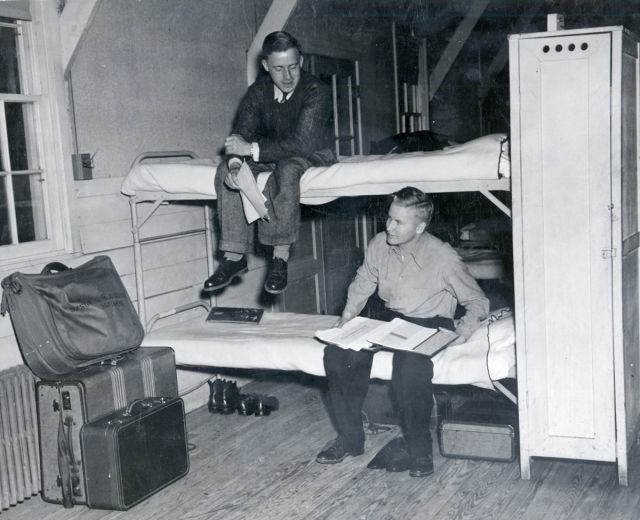 Students studied on bunk beds in this barracks-style dorm, circa 1945. 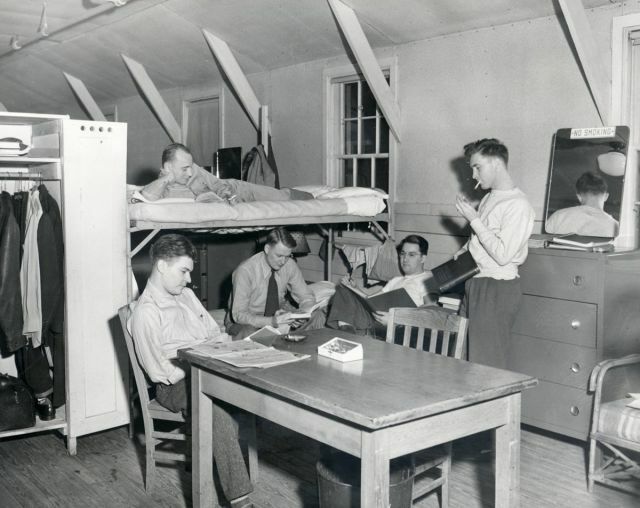 In 1945, single men's housing was $13/month, with bunks and linens furnished. Smoking was banned, but no one told this guy. 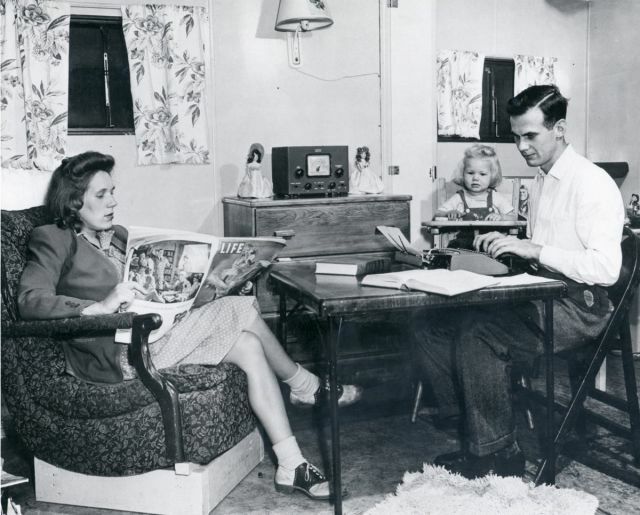 The university had separate housing for married students and families, as seen in this 1946 photo. 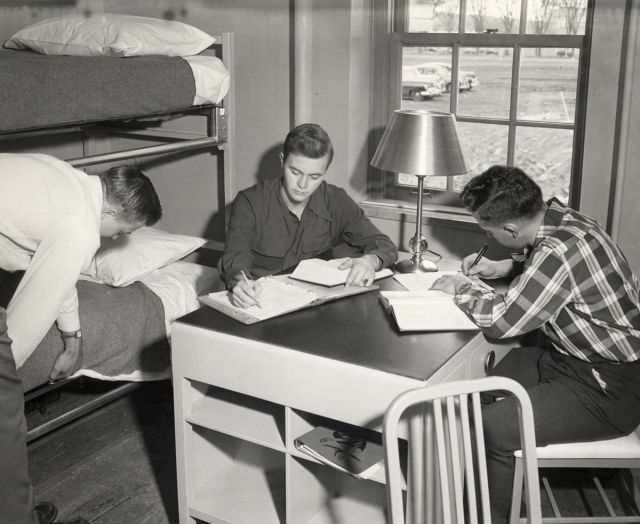 In the 1950s, students studied around a communal table (and did a great job making their beds). 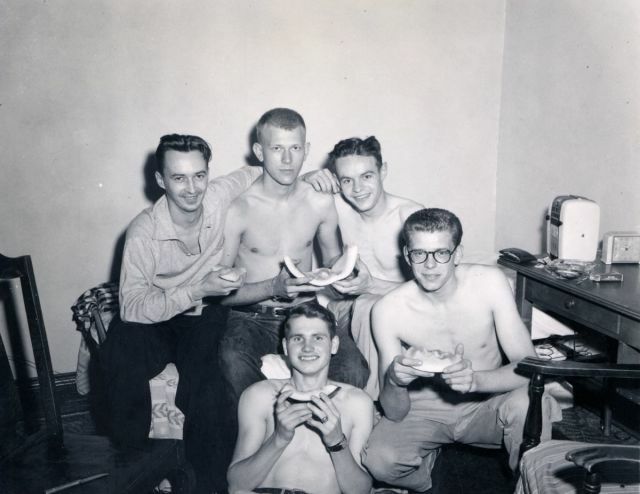 Just a bunch of guys hanging out, eating melon, in this 1950s image. 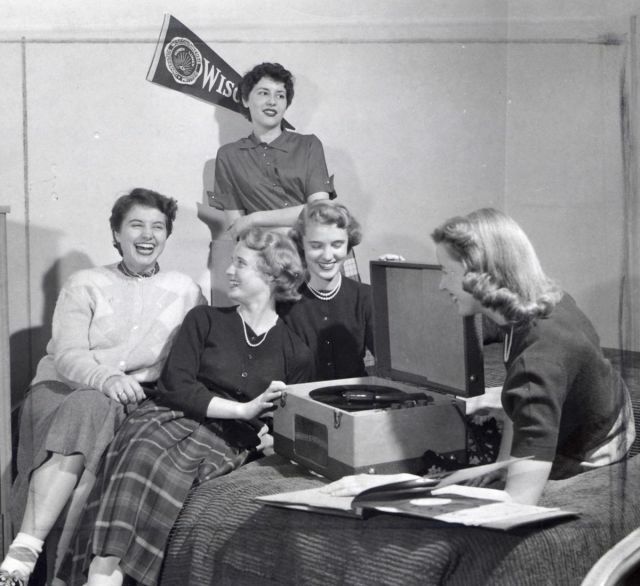 In a girls' dorm at the same time, women jammed to a record player. This 1950s photo features an impressive perfume collection. Guitar-playing co-eds are nothing new. 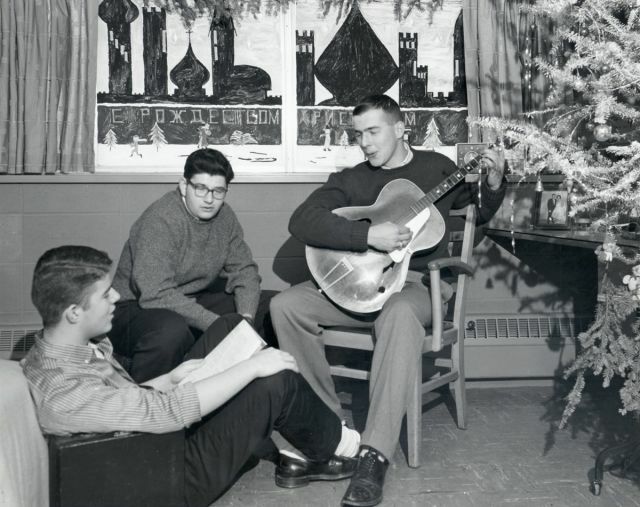 Note the Russian mural, which reads "Merry Christmas," in this picture from 1958. 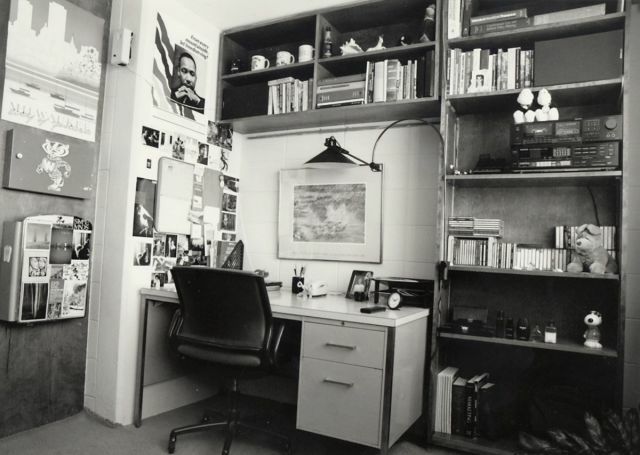 One student went minimalist in this 1960s snapshot. 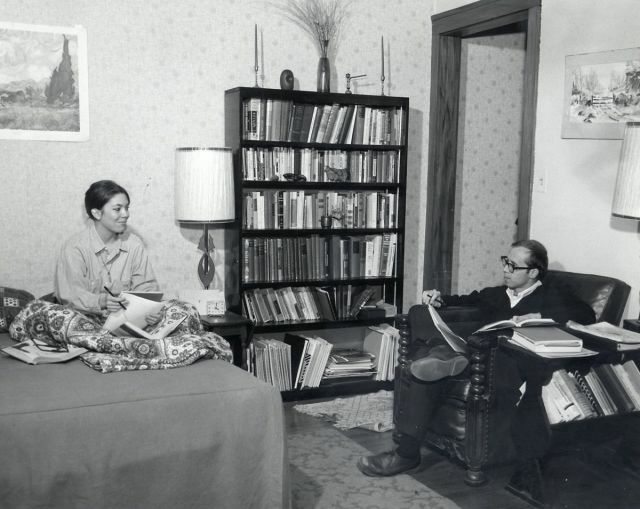 Special housing for married couples remained through the 1960s. 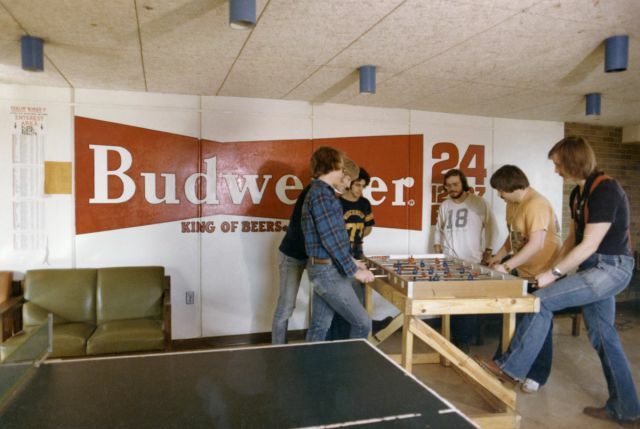 This '70s student lounge looks pretty fun, with games like foosball and ping pong. 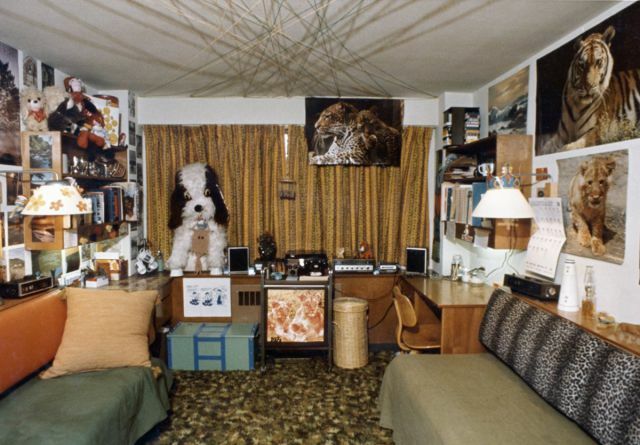 This dorm room from the 1970s was pretty groovy. But it was tame in comparison to this animal-filled lair. 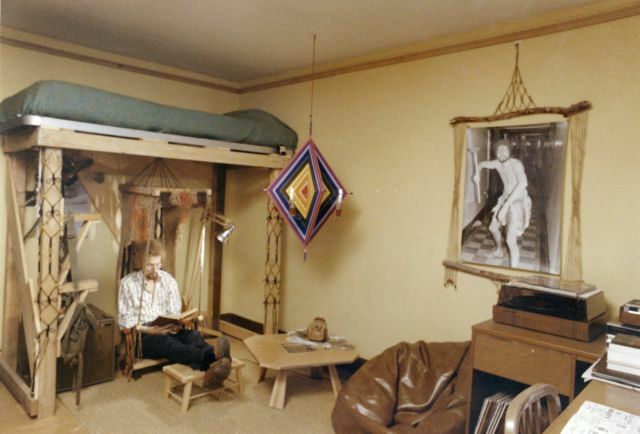 And this funky single, complete with a lofted bed, hanging chair, and dreamcatcher. Not sure what's happening on the ceiling in this picture from the 1970s. 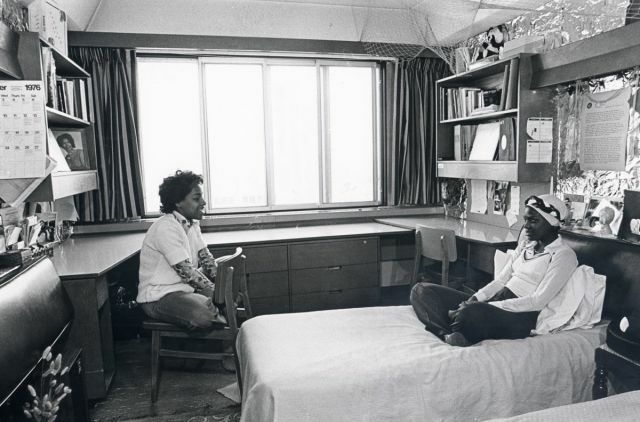 Two women catch up in a dorm room in this 1970s photo. A well-coordinated triple, also from the '70s. 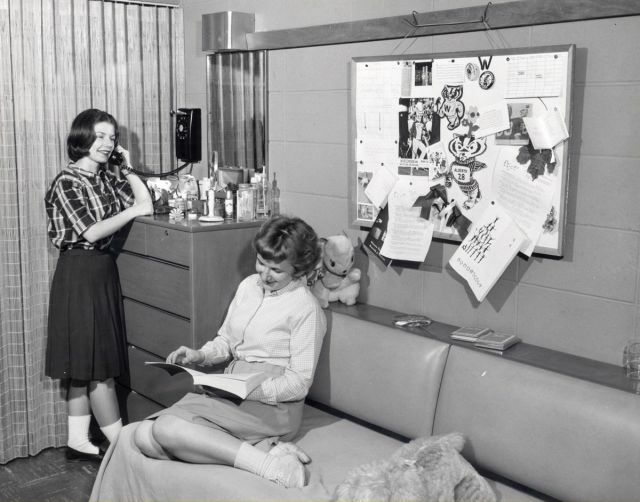 We're guessing this was a freshman dorm. 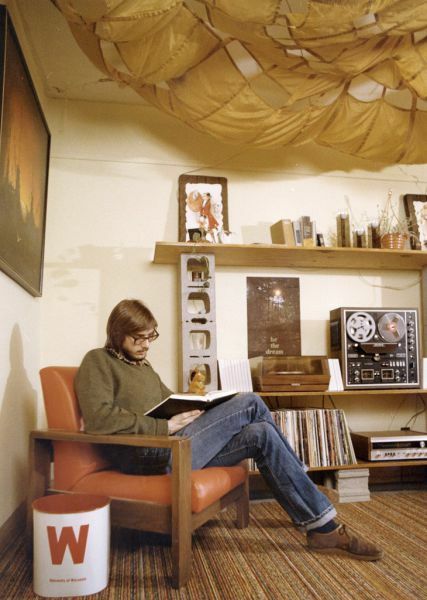 These guys got creative with their small space and opened a bar (photo c. 1970-1980). 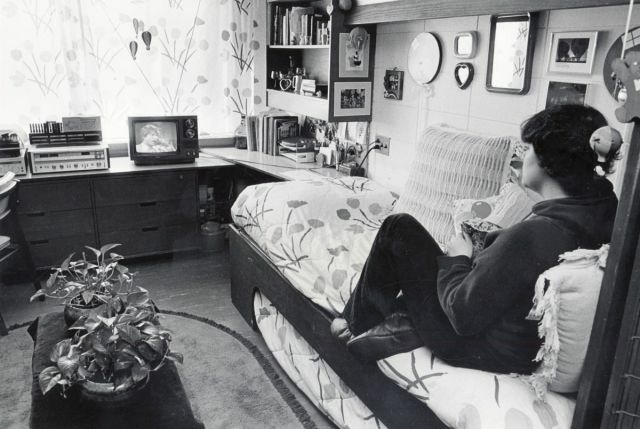 In the early 1980s, TVs started appearing in dorm rooms, distracting students everywhere. 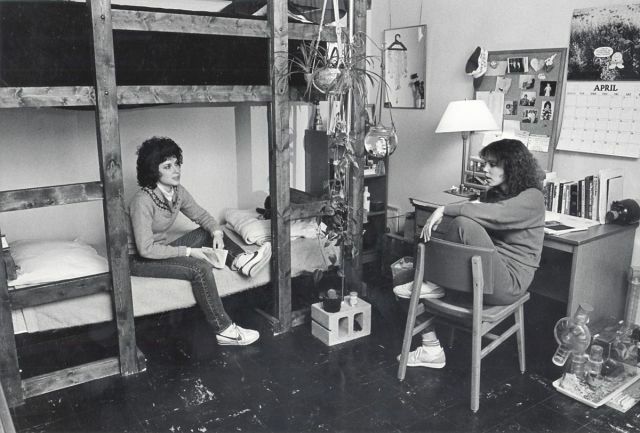 Is that a hamster cage in the bottom righthand corner of this 1980s dorm photo? 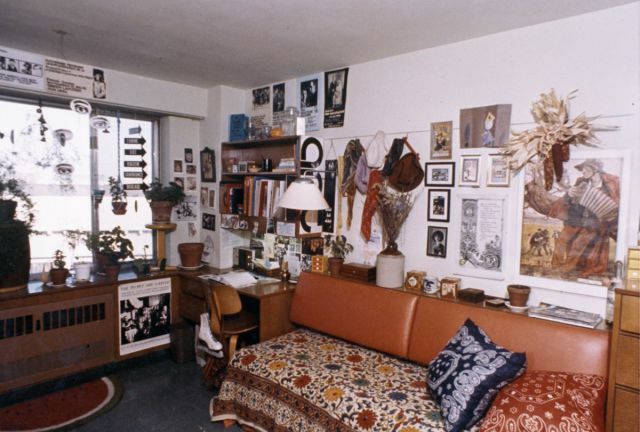 This '80s dorm had lots of personal touches, from a poster of Dr. Martin Luther King, Jr. to a Snoopy statuette. We like what the guys in this 1986 photo did with the place. And the fireplace is a rare luxury for a college dorm. 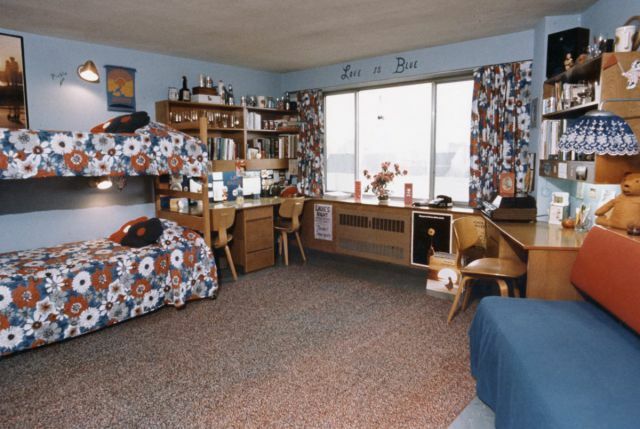 Everything about this photo of a women's dorm screams "1987." 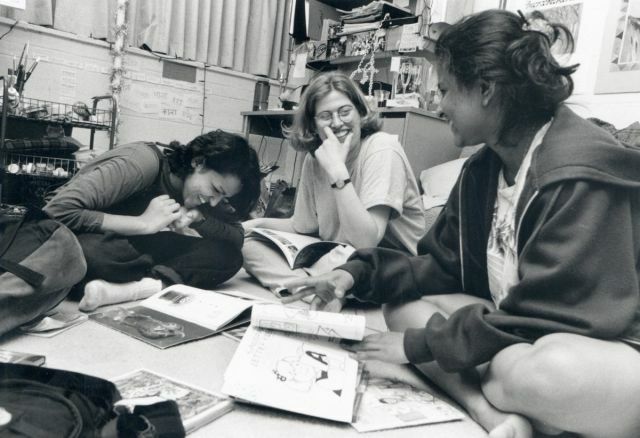 Students gathered to study in a residence hall den, as seen in this 1996 picture. 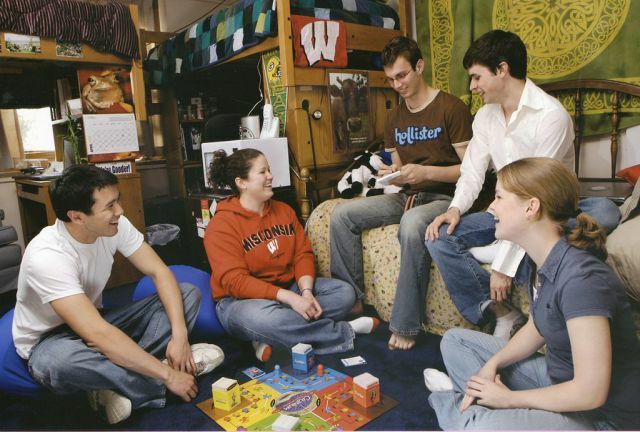 A 2005 photo shows students taking a study break with a game of Cranium. Students chat in this recent image. You can probably guess it was taken in 2008, thanks to the "Hope" poster. 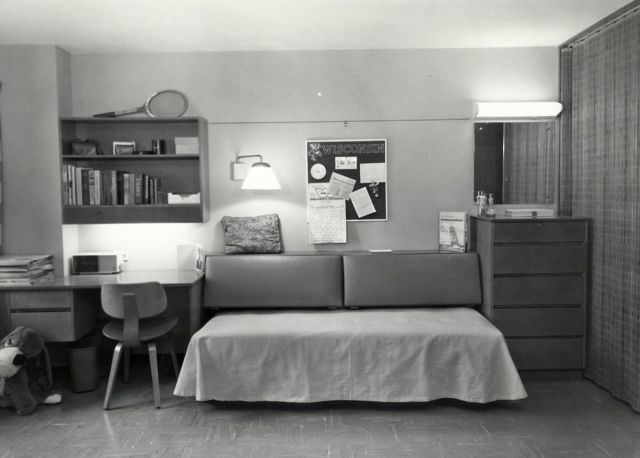 Those dorm rooms were huge! #23, it's a parachute hanging from the ceiling.